Notes: The European Starling, as the name implies, is not a native species. America's population can be traced back to a release of about 100 birds into Central Park around 1900. They have been highly successful and have spread throughout the continent. 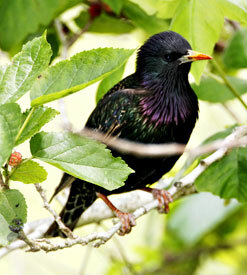 Adult starlings in non-breeding plumage are blackish-brown with white speckles and dark bills. Juveniles are a soft brown. Starlings are opportunists and will take advantage of any cavity, including traffic lights, to use for a nest. Competition for nesting sites is intense among cavity-dwellers, and the aggressiveness of starlings poses problems for many native species.